Once we’ve been touched by cancer in one of our dogs, it influences all aspects about how we raise our other fur kids, from what they eat to how we interact with our veterinarians. We all want to know: what can we do to avoid the canine cancer rollercoaster again? “Dr. Messonnier is a proponent of integrative medicine, recommending holistic support of conventional therapies. He does not discount chemotherapy or radiation treatment but recommends supplements and other therapies to enhance the ability to fight cancer and also to reduce side effects. Dr. M. puts everything into easily understood terms; the book is not overly technical but thorough and can be a useful reference in fighting your dog’s cancer. 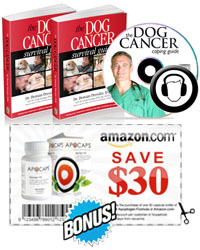 The first few chapters cover the basics of canine cancer very well, explaining how it develops, early symptoms for several common cancers, how they are diagnosed, how to proceed, and how to work with your vet. I found it interesting that large and giant breed dogs are 61% to 185% more likely to develop osteosarcoma than dogs that weigh less than 75 lbs. Dr. M. recommends x-rays to rule out cancer immediately for these at-risk dogs. How many of us have had the vet tell us “muscle strain” only to find out a month later that it was cancer? He specifically warns that NSAIDS are so good at pain control that diagnosis is often delayed. So don’t be afraid to insist on x-rays early. He also recommends aspirating every single lump, never take the “wait and see” approach. Conventional therapies, the mechanisms by which they work, and side effects are described in the next chapter. If the thought of chemo scares the pants off you, then read this. It demystifies chemotherapy. You may or may not decide to proceed with it, but at least you’ll make an educated decision (although not every chemo drug is covered). The discussion on side effects is good in that it tells you when to pick up the phone and call, and when to hustle your baby to the nearest emergency clinic. The next chapters cover complementary therapies. The sections on acupuncture and chiropractic are quite short. The sections on herbs and supplements are good references if you want to be knowledgeable when working with a holistic vet, as it describes specifically why each herb is useful and for what specific condition. These are the longest sections of the book as he describes each herb or supplement individually and is very thorough in his discussion. He warns repeatedly to consult a knowledgeable vet and do not try to figure it out on your own, as these agents can be toxic. Also, holistic treatment is very individual. What works for one dog is not necessarily suitable, and possibly dangerous, for another. The main value of the book is as a reference to educate yourself while working with an integrative medicine vet. It explains things very well, and will give you ideas about questions you should ask your vet about your pup’s care plan. Many thanks to TatesPeeps’ Mom Jan for this thorough book review. If you have a great book that you think Tripawds members should know about, contact us today, we would love to help you spread the word. This Tripawds book review is dedicated to the memory of Spirit Tate.